See animation - COOL ! The CFX96 Touch real-time PCR detection system builds on the power and flexibility of the C1000 Touch thermal cycler to create an exceptional real-time PCR system. Its unsurpassed thermal cycler performance plus innovative optical design produce accurate, reliable data. The powerful yet intuitive CFX Manager software accelerates every step of your real-time PCR research, shortening the time between getting started and obtaining great results. The CFX96 system's solid-state optical technology (six filtered LEDs, each with a corresponding filtered photodiode) maximizes fluorescence detection for specific dyes in specific channels, providing sensitive detection for precise quantitation and target discrimination. 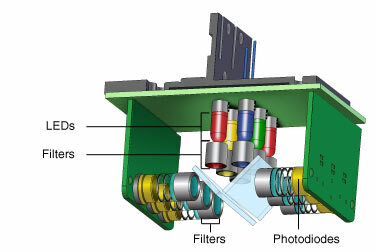 Scanning just above the sample plate, the optics shuttle individually illuminates and reads fluorescence from each well with high sensitivity and no cross talk. At every position and with every scan, the optics shuttle is reproducibly centered above each well, so the light path is always optimal and there is no need to sacrifice data collection in one of the channels to normalize to a passive reference. 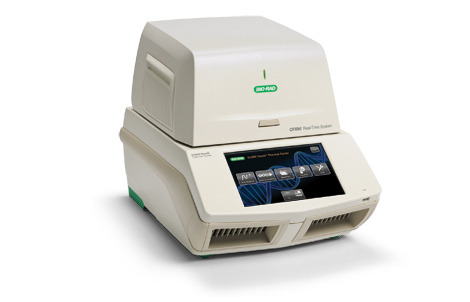 The CFX384 Touch real-time PCR detection system builds on the power and flexibility of the C1000 Touch™ thermal cycler to create a high-throughput real-time PCR system. With unrivaled stand-alone functionality, innovative optical design, and unsurpassed thermal cycler performance, the CFX384 Touch shortens the time between getting started and obtaining great results. 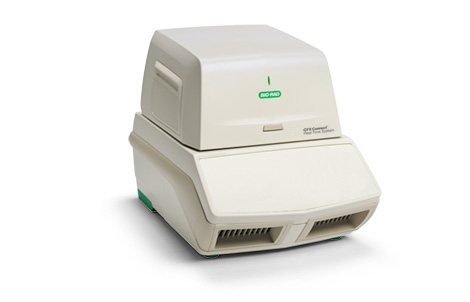 The CFX Connect real-time PCR detection system incorporates industry-leading optics with a Peltier-based reaction block for precise and reliable qPCR data acquisition. The system offers an integrated solution for all your SYBR®Green/EvaGreen and duplex experiments. A thermal gradient is easily generated across the 96-well reaction block to support rapid optimization of real-time PCR assays. The CFX Connect system includes the powerful CFX Manager softwarefor system operation, experiment setup, and data analysis. The new MyiQ real-time PCR detection system offers an affordable alternative for the detection of common green fluorescent dyes such as FAM and SYBR Green I. This system interfaces directly with the iCycler thermal cycler, offering superior features such as thermal gradient and Peltier-effect driven performance. The MyiQ real-time PCR detection system is a perfect solution for those just getting started with this technology as well as those looking for additional instruments to handle increasing routine assay demands. This system was developed by the same experts at Bio-Rad who have pioneered performance in real-time PCR. The MyiQ delivers the same excellent-quality data as the iCycler iQ real-time detection system. The iQ5 real-time PCR detection system offers a fresh design for Bio-Rad's new generation of real-time PCR instrumentation. 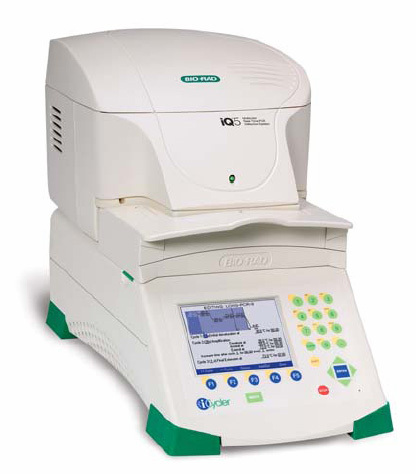 Like its predecessors, the iCycler iQ and MyiQ systems, the iQ5 optical system is a modular upgrade to the iCycler thermal cycler with 96-well reaction block. This powerful new system offers five-target analysis capabilities for multiplex PCR, coupled with a completely redesigned software package. The iQ5 optical system software offers a full suite of enhanced data collection and data analysis options, including tools for gene expression analysis that measure relative quantities without a standard curve. 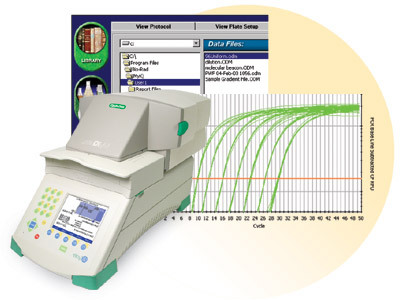 Regardless of your PCR application, you will find that the iQ5 real-time PCR detection system is the ultimate system for value and flexibility. as readily as any of our interchangeable sample blocks. Interchangeable detector fits standard DNA Engine base units, new or existing. The Chromo4 detector slides into the base in just seconds without the need for tools. Swappable Chromo4 photonics shuttle can be ordered with customized filter sets. Multiplex with up to four colors. All 96 wells are independently excited and detected for each color to minimize crosstalk. Compact size and broad dynamic range make this one of the smallest, most sensitive real-time systems. 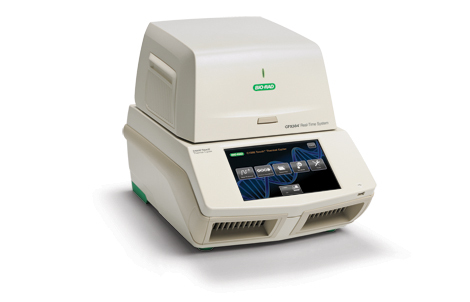 DNA Engine thermal cycler offers precise thermal control and a temperature gradient feature. DNA Engine® thermal cycler offers precision thermal control and a temperature gradient feature permits simultaneous incubation at 12 different temperatures to optimize reactions in a single run. Real-time results allow for plotting of signal intensity vs. cycle number and graphically monitoring the thermal profile during the run. Extraordinary sensitivity permits reliable detection of one initial template copy, while delivering a linear range of up to ten orders of magnitude in starting copy number (with appropriate chemistry). Researcher-oriented software allows quantification of samples and generation of melting curves to verify product identity. Innovative optical system incorporates an array of 96 LEDs for excitation and a pair of sensitive PMTs for detection in a robust, no-moving-part design. High sample capacity accommodates up to 96 samples in standard, low-profile microplates or strip tubes making specialized disposables unnecessary. A compact footprint (34cm wide x 47cm deep x 60cm high) ensures that the Opticon system comfortably fits on any lab bench.